Our research explores the public’s acceptance of three key moral principles from just war theory. 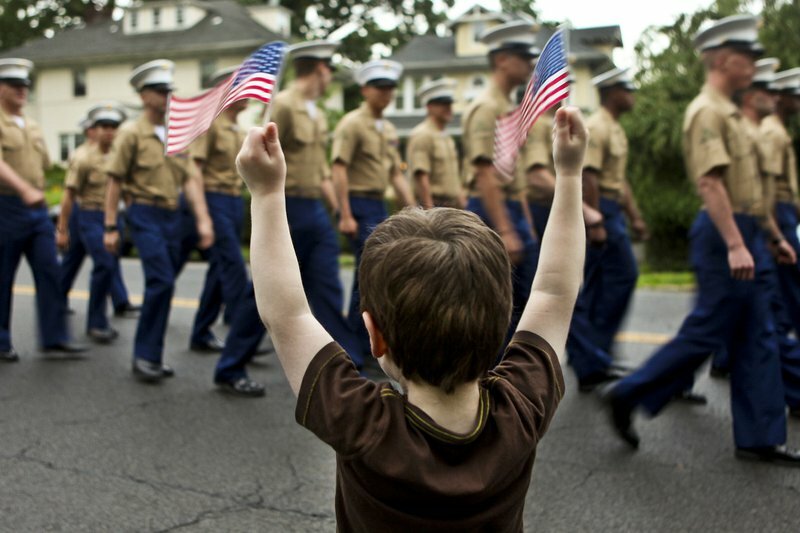 These principles are usually referred to as “distinction” (sometimes called “non-combatant immunity”), which prohibits the intentional targeting of non-combatants; “proportionality,” which asks military decision makers to weigh the costs to foreign civilians of a particular operation against the operation’s contribution to winning the war; and “due care” which requires that combatants try to minimize collateral damage, even if that means accepting some increased risk to themselves. To explore these questions, we conducted three related survey experiments in August 2014 on a large, representative sample of American citizens. In each experiment, subjects were randomly assigned to read a different mock news story about a hypothetical US military crisis in Afghanistan. In each article, subjects read that the United States had identified a Taliban target in an Afghan village and was considering various options to attack it. Each story then varied just one critical aspect of the scenario to highlight the application of different just war principles. In the distinction experiment, subjects read that the US had discovered a chemical weapons facility in the village and was considering two airstrike options for attacking the target. The first option, a small-scale strike, had a 45% chance of destroying the target but would result in an estimated 20 collateral Afghan civilian fatalities. The second option, a large-scale strike, would double the chances of destroying the target to 90%, but increase the Afghan civilian fatalities in the village to 500. The different stories then varied whether the Afghan villagers were political supporters or opponents of the Taliban and whether or not the US would intentionally target the civilians. After reading the story, subjects were then asked which strike option they most preferred. 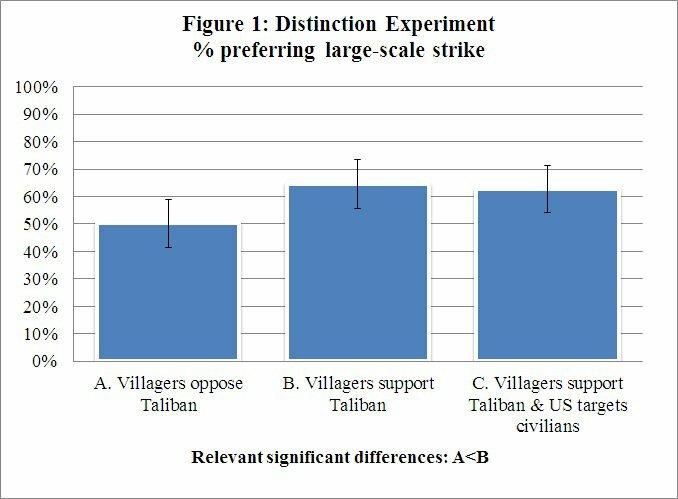 Contrary to the principle of distinction, we found that the public did not decrease its support for the large-scale strike even when the story stated that the strike would deliberately target civilian dwellings in order to “send a strong signal” to other villages not to support the Taliban (see condition B vs. C in figure 1). Indeed, nearly two out of three Americans expressed a preference for the large-scale strike when it intentionally targeted civilians. Moreover, again contrary to just war teachings, we found that Americans were significantly more likely to prefer the large-scale strike when the victims were described as political supporters of the Taliban than when the victims were Taliban opponents. In the due care experiment, subjects again read that the US had discovered a Taliban chemical weapons laboratory. In this story, however, US leaders were choosing between an artillery strike, which would kill 200 Afghan civilians but avoid any risk to US troops, and a house-to-house assault, which would kill no Afghan civilians but placed US troops at greater risk. The news stories then increased the number of US military deaths in the house-to-house option from 5 to 50, while holding Afghan civilian casualties and all other features of the story constant. 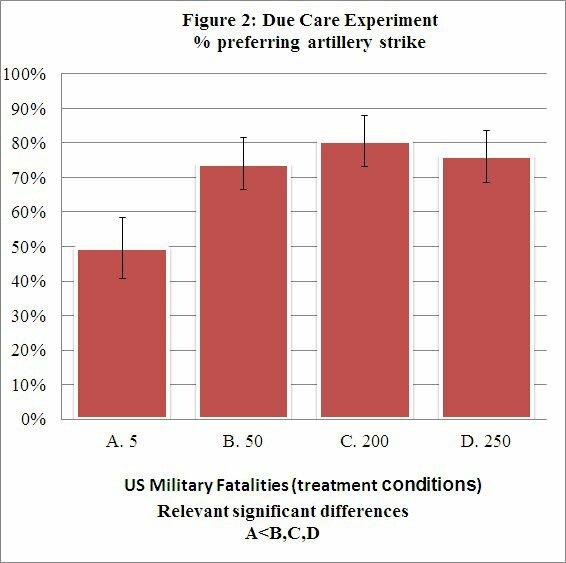 Consistent with the principle of due care, we found that support for the artillery strike declined as the number of US military fatalities it would avert declined (see figure 2). Even when the artillery strike would avert the deaths 5 American soldiers at the cost of 200 Afghan civilian deaths, however, only a bare majority (50.5%) preferred the more discriminating door-to-door assault. When the artillery strike would allow the United States to avoid 50 military deaths, the preference for the artillery strike increased to nearly three-quarters of the population. Our results indicate that Americans do appear to weigh foreign civilian deaths against the military importance of the target as the proportionality principle advises (see figure 3). Support for the less discriminant, large-scale strike dropped by over 20% when the meeting was described as “low level”. Nevertheless, a surprisingly large minority of the public (44%) preferred the large-scale strike—killing 180 additional Afghan civilians—even when American military leaders explicitly concluded that it would have little impact on the war. Taken together, these findings reveal that the public’s commitment to the principles of distinction, proportionality and due care are heavily biased in favor of protecting American lives and national security interests in ways that suggest limited support, at best, for most interpretations of just war doctrine. This conclusion is reinforced by our previous research that found high levels of public support for using nuclear weapons when those weapons provided a substantial military advantage over conventional weapons. Our findings suggest we cannot rely on the moral instincts of the American public to act as a strong check on American military operations that violate human rights. Although these findings may appear inconsistent with the research by Sarah Kreps and Geoffrey Wallace, which finds that the public is influenced by concerns about compliance with international law, our results are more complementary than they may seem. Kreps and Wallace find that providing the public with arguments that drone strikes violate international law reduces support for drone strikes by between 6-8%. Yet over 40% of the public approved of the strikes even when told they would violate international law (this was almost twice as many subjects as opposed the strikes). Thus, as in our experiments, although the public is not unmoved by concerns for justice in the use of force, many Americans appear willing to put aside those concerns in times of war.